When Roland Johnson announced his retirement in March 1992, the Madison Symphony Orchestra was in fine shape. His tenure as the orchestra's conductor, which had begun in 1961, had seen an enormous transformation in the activities and organization of the Madison Civic Music Association (MCMA): umbrella organization for both the MSO, Madison Symphony Chorus and Madison Opera. The orchestra itself had undergone a name change, from the Madison Civic Symphony to Madison Symphony Orchestra: a change that was emblematic of deeper changes in the role of the orchestra in the committee. Since its founding in 1926, the orchestra had been a largely amateur "civic" organization, but by the 1970s, the MSO was on a fully professional footing. The orchestra flourished in a new home, the Oscar Mayer Theatre, and its performances had reached a high level. The MCMA's annual budget, which had seldom exceeded $5,000 in the first 35 years, had increased to nearly $1,000,000 by the 1992-93 season, and there was a full-time staff of four administering the "business end" of the MSO's activities. From a small beginning in 1961, the Madison Opera had grown into a fine regional company that was about to embark upon a stunningly audacious venture: the commissioning and premiere of a new grand opera, Shining Brow. 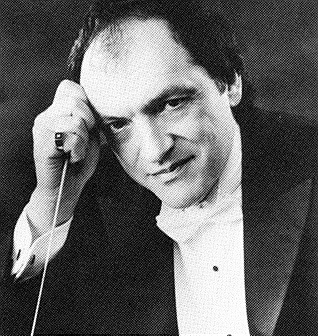 Johnson's announcement of his retirement, which would be effective at the close of the 1993-94 season allowed the MCMA two full seasons to find its fourth music director. An official search was in fact something entirely new in the history of the organization. Sigfrid Prager, the orchestra's first conductor, had been in the right place at the right time: an eminently qualified musician from Europe (a European pedigree was a virtual requirement for a conductor in America at this time), who was visiting Madison at the very time the MCMA was attempting to create an orchestra. Upon his retirement, Prager chose his own successor: Walter Heermann, a fellow German immigrant with whom he had been associated at the University's Summer Music Clinic. Though there was some pretense of a search when Heermann's own retirement was announced, he in turn prevailed upon the MCMA to hire a former protégé, Roland Johnson. The orchestra had thrived under all three, but by the 1990s, the MCMA was a much bigger and much more professional organization, and a formal search was a necessity. The MCMA Board began an international search during the 1992-93 season, lead by a committee that included board members and representatives from the orchestra, chorus, and the Madison Opera. In August of 1993, the committee announce its three finalists, selected from a pool of 159 applicants: John DeMain, Director of the Houston Grand Opera; Joseph Giunta, Director of the Des Moines Symphony Orchestra; and George Hanson, Assistant Conductor of the Atlanta Symphony Orchestra. Each of the three brought very different credentials to the table. DeMain was clearly the biggest "name" of the three—a conductor with an international reputation, particularly in the opera world. Giunta, who worked with an orchestra in many ways similar to the MSO, had a reputation as a "program builder." Hanson, the youngest of the three, was cited as a "rising young star" by the MCMA. Each of the three candidates would conduct a concert with orchestra in the first half of the 1993-94 season, and an announcement would be made in the spring of 1994. DeMain was the first of the three to conduct, leading a concert on October 16. Reviews were enthusiastic, despite a rendition of Wagner's Tannhaüser overture that was flawed by poor intonation in the strings. Under DeMain, the orchestra turned in an exhilarating version of the Vieuxtemps Concerto No.5 with violinist Alyssa Park and a stunning performance of Shostakovich's Symphony No.5. The Shostakovich symphony contains a vast range of emotions, from bitterness and quiet resignation to startling violence, and DeMain's reading was profoundly exciting for both orchestra and audience. Giunta's audition a month later was an all-Romantic program: the Tchaikovsky Serenade, Liszt's Piano Concerto No.1, with a brilliant performance by José Feghali, and Rachmaninoff's Symphony No.2. Though the concert was well-received, Giunta withdrew his application soon after his visit to Madison. The third candidate, George Hanson, appeared with orchestra on January 15, 1994. His chosen program was an ambitious one: Mozart's Zauberflöte overture, a little-known work by Bernstein, the prelude to Act III of his opera A Quiet Place, Elgar's Cello Concerto, and the Dvorák "New World" symphony. Hanson's choice of the challenging prelude from A Quiet Place was intended as an homage to his mentor, Leonard Bernstein. It was also a bit of (probably unintended) one-upmanship: DeMain had conducted the opera's premiere in Houston a decade earlier! Hanson's concert was a fine one, with an excellent performance of the Elgar concerto by cellist Shauna Rolston, and a surprisingly fresh reading of an old orchestral warhorse by Dvorák. Speculation reached a high pitch in early 1994. The choice between the two remaining candidates, DeMain and Hanson, was a difficult one. The general feeling among orchestra members was that, with two very well-qualified candidates interested in the job, this was a "win-win" situation for the MSO. The committee made a relatively quick decision, and on February 4, they announced to the local press that John DeMain had accepted the position. The committee's decision, which was unanimous, had been based upon many factors, but DeMain's fine rapport with the orchestra and its backers, and his operatic background were primary considerations. The appointment was actually a bit of surprise and a coup for the MSO: some saw DeMain's decision as something of a sideways step for a conductor who already had a prestigious job in Houston and an active international career. In looking back seven years later, DeMain himself sees nothing surprising at all: though he had (and still has) an active career in the field of opera, he had long wanted to take charge of a symphony orchestra. "In this country," he remarks, "you get 'tracked' as either a opera conductor or an orchestra conductor, and I wasn't ready to be pigeonholed." He refers to his distiguished tenure in Houston as "an 18-year detour from orchestral conducting." For a few years, DeMain had been looking for an orchestra like Madison's: an established ensemble he could develop. He attended the premiere of Shining Brow in 1993, both to hear the new opera and to "check you guys out." He was impressed by what he heard: "...a great group of winds, and a string section that had potential." The MSO's fourth Music Director was born in Youngstown, OH in 1944. DeMain was a prodigy as a performer and as a conductor: he remembers filling in as conductor the school band in fourth grade, and at age fourteen, he conducted his first theatrical work, a production of Brigadoon by the local theater troupe and a professional orchestra. At age twelve, as a boy soprano, he sang the title role in a professional production of Amahl and the Night Visitors. DeMain began piano studies at age six, and at eighteen made his debut as a soloist, playing the Beethoven Concerto No.1 with the Youngstown Symphony Orchestra. DeMain earned Bachelor's and Master's Degrees in Music from the famed Juilliard School in New York City, and became the conductor of the Norwalk (CT) Symphony Orchestra in 1971. In 1973, he was one of the first recipients of an Exxon/National Endowment for the Arts conducting grant, a program intended to encourage the development of young American conductors. As part of his fellowship, he was appointed Associate conductor of the St. Paul Chamber Orchestra, a position he held for two seasons. This period also saw his debut on the podium of the the Pittsburgh Symphony Orchestra. In 1975, while still working as an Exxon/NEA Fellow, DeMain moved to Houston to take a post as Music Director of the Texas Opera Theater, the "touring arm" of the Houston Grand Opera. In 1976, he was asked to lead the HGO's revival of Porgy and Bess, and a recording of this production earned a Grammy Award and in 1977. That year, he was named Music Director of the HGO. DeMain's eighteen-year tenure with this organization brought it to national prominence with fine productions of standard repertoire, but he was particularly well-known for productions of 20th-century American operas. While at Houston, DeMain conducted premieres of operas by Leonard Bernstein, Carlisle Floyd, and John Adams. During his tenure with the HGO, DeMain also held appointments as Artistic Director of Opera Omaha and Resident Conductor of the Houston Symphony Orchestra. DeMain remains active in the opera world, serving as Artistic Director for both the Madison Opera and Opera Pacific in Orange County, CA. Both in Houston and in Madison, DeMain has maintained a busy schedule of guest conducting engagements. His schedule has taken him to engagements at festivals and opera companies across the country, but he has also lead orchestras and opera productions in Canada, England, Spain, France, Germany, Italy (at Milan's famed La Scala), Poland, Brazil (the 1992 Concert for the Planet Earth with Placido Domingo), Hong Kong, New Zealand, and Australia. DeMain's opening concert with the MSO and Chorus was a triumph. The first work was a familiar choral piece, Mozart's Ave verum corpus. The second was a tribute to Leonard Bernstein, the formidable Chichester Psalms for brass, percussion, and chorus. For the final work of the program, DeMain challenged the orchestra with Mahler's Symphony No.1—the beginning of a long-term cycle of Mahler's symphonies. Though over three quarters of the orchestra's membership was the same as in the previous season, this was clearly a "new" MSO, capable of taking on the most challenging repertoire. What is it like to play under Maestro DeMain? One prominent history of the symphony orchestra describes the conductor as "the ultimate autocrat in a democratic world." However, there is nothing particularly democratic about rehearsals and performances by a symphony orchestra to start with, and musicians deeply appreciate a conductor who takes charge, and who has clear musical ideas. DeMain is clearly in charge of the MSO, but treats his musicians respectfully, as fellow professionals: the implicit understanding is that we come into the first rehearsal knowing the "notes" so that we can work on details of ensemble and more subtle elements of musical interpretation. According to DeMain, he sees his job as tapping into the "collective intelligence" of 90 highly-trained players. Many conductors love to talk about the work and their own interpretations. DeMain seldom uses rehearsal time for self-indulgence, though a well-placed joke or two often lightens the mood. Rarely does he fail to use all 150 minutes of scheduled rehearsals--indeed, he has an uncanny sense of timing for using rehearsals in such a way that the final chord of a symphony often sounds when there is less than a minute left on the clock! DeMain is particularly adept at communicating his ideas in rehearsal, through explanation, gestures, and facial expressions. One mark of a true master conductor is DeMain's ability to pace preparation over a series of five rehearsals in such a way that the orchestra "peaks" on Saturday night and Sunday afternoon. And who are the musicians? For nearly all of us, the MSO is a lucrative part-time job, and players support themselves in other ways. The orchestra's ranks include many private, public-school, and college music teachers, and there are also freelance musicians who work in every style of music, from other orchestra jobs and chamber music to Jazz, Blues, and Rock gigs. There are state employees, editors, a carpenter, full-time parents, and many other "day jobs" represented in our ranks as well. The orchestra—particularly the string section—is also invigorated by a steady stream of University music students, who play in the MSO for two or three years, before moving on to graduate study or other professional positions. DeMain's first season as Music Director marked not only a new face at the helm, but a thorough reconstruction of the organization. The Madison Civic Music Association had been instituted in 1925 to sponsor public concerts, and since 1926, it had served as the umbrella association that administered the Madison Civic Symphony (later Madison Symphony Orchestra), Madison Civic Chorus (Madison Symphony Chorus), Madison Civic Band, and eventually the Madison Opera. The Civic Band had long since gone its own way, and the Madison Opera had always maintained a degree of independence from the MCMA, with its own Advisory Board, and budgeting and fundraising that were largely separate from the parent organization. During the previous season, the MCMA and Opera Boards announced that the two organizations would split. The MCMA would officially dissolve, and the two separate organization would divide its resources. Under this agreement, which was in place by the time DeMain arrived, the two organizations had incorporated as Madison Symphony Orchestra Inc. (an organization which included the Madison Symphony Chorus) and the Madison Opera. Connections remained, however: he MSO and Madison Opera share their Music Director and the MSO remains the exclusive "pit orchestra" for the Opera's productions. It was apparent from the start that DeMain's relationship with the MSO would be different than that of his predecessor. Though he occasionally took guest conducting jobs, Johnson's time had been almost entirely devoted to the MCMA's groups and work at the Vocational School, meaning that he was almost constantly available for musical and administrative duties. DeMain maintained a busy, international conducting schedule, and would eventually take a position as the Music Director of Opera Pacific as well. On many occasions over the past seven seasons, he has either flown in to Madison just in time to begin a series of rehearsals with the orchestra, or has been on a plane to a new engagement within hours of concluding an MSO concert. While the longstanding tradition of weekly orchestra rehearsals was a thing of the past by the end of Johnson's tenure, preparation for subscription concerts was still a rather leisurely affair in the late 1980s and early 1990s, with four or five rehearsals spread over two weeks prior to the concert. This schedule would not work for DeMain, who liked to compact preparation into a single week. Initially, this caused some grumbling among orchestra members, with many players obliged to give up or reschedule lucrative private teaching to accommodate Saturday morning dress rehearsals. In the end, however, this more concentrated schedule has become part of the orchestra's routine, and most players agree that the more focused rehearsal schedule—while occasionally exhausting during "symphony weeks"—has led to a better musical result. The orchestra also plays under at least two guest conductors during season, which often provides a refreshing change in outlook: MSO players fondly remember performances with David Lockington, Joanne Falletta and other guest conductors in the past few years. Taylor's duties as Assistant Conductor go beyond working with the chorus. She typically conducts three programs or more each season: typically special programs like "Pops"-oriented subscription concerts, youth concerts, and runouts. As "cover conductor"--ready to step in, in case DeMain or a guest conductor is unable to attend a scheduled service--Taylor prepares for all of the orchestra's repertoire each season. Shes is also a fixture at rehearsals for subscription concerts, sitting in the hall and providing notes on the orchestra's playing at the final few rehearsals. In 1928, the Madison Vocational School (later MATC) saved the fledgling MCMA by taking Sigfrid Prager on as an instructor. Prager, Walter Heermann, and Johnson all served as Directors of MATC's Music Department during their tenures. DeMain's relationship with MATC would be a looser one--as an Artistic Liason. DeMain sees his role with respect to MATC as an extremely positive one, promoting concerts at MATC's Mitby Theater, and "looking for more ways we can work together" to promote adult music education. Even the orchestra's relationship with the administration changed in this period. In 1993, the Orchestra Committee, elected officers from the ranks of the orchestra, negotiated a completely revised Agreement with the MCMA Board. The orchestra negotiated directly with the board, and the new Agreement dissolved the official, though tenuous relationship between the MSO and the Musicians' Union. Subsequent negotiations for three-year agreements have been relatively successful, and orchestra and board have generally been able to reach compromises amenable to both sides. The MSO's General Manager during this period of change was Sandra Madden. In thinking back over her tenure, Madden expressed particular pride over the orchestra's "fiscal responsibility" in this period: the MSO never ran into deficit in these years and experienced a tremendous growth in both its audience and its endowment. She also built a competent staff that was able to take advantage of the tremendous changes in the MSO in this period. One of Madden's finest hires was Development Director Lisa Fusaro—who recently retired—a master of effective fundraising who was indirectly responsible for much of the MSO's financial health in this period. Madden "adored" her working relationship with DeMain: "If every Executive Director and Music Director had a relationship as open and honest as what John and I had, there would be fewer problems in today's professional orchestras." In 1998, Madden left to take a job with the Colorado Symphony. Her successor, Richard Mackie, had worked for many years as Development Director of Edgewood College. Mackie, who joined the MSO in March of 1999, will face a no less daunting set of challenges as the organization makes its next momentous change, the move to the new Overture Center. The past seven years have seen a steady increase in the quality of the orchestra's playing. While much of this improvement can be credited to DeMain and changes in personnel and rehearsals, it also can be attributed to the orchestra's increasing number of public performances. In an interview published during his first season with the MSO, DeMain discussed plans to double the number of subscription concerts: performing a Saturday evening concert and a Sunday matinee for each program. This represented a huge marketing challenge for the orchestra. By 1993, the MSO's Saturday evening subscription concerts sold very well, and occasionally filled the Oscar Mayer Theatre, but to fill the hall twice on a weekend was an enormous task, and this goal was accomplished incrementally. The December and May programs were "paired" in this way during his first season. The orchestra performed four double concerts during the 1995-96 season, and six pairs the next season. Since the 1997-98 season, all eight subscription concerts have been performed twice. Filling the Sunday matinees has been a very gradual process over the last few years, but now both concerts play to nearly full houses. Effectively doubling the MSO's audience in seven years is the happy result of a better musical "product," but is has also been the result of fine work by MSO Marketing Directors like Craig Robida and Sherri Trent. The MSO has repeatedly shown in the past few years that it can tackle difficult repertoire: the first five Mahler symphonies, the Bartók Dance Suite, Shostakovich's ninth and tenth symphonies, and many other large works. In programming the MSO's repertoire, DeMain has attempted to strike a balance between the standard 18th-century, 19th-century, and early 20th-century works that are the "meat and potatoes" of any symphony orchestra and works which will stretch the limits of the players and the audience. The MSO has maintained a record of commissioning substantial new works: the past seven years have included two new works by Daron Hagen, and premieres of works by Stewart Wallace, David DiChiera, Michael Torke, Johns Stevens, and others. Our repertoire has also included challenging modern works by Joan Tower, Michael Daugherty, Benjamin Lees, Chistopher Rouse, and Peter Schikele. The tradition of a benefit Pops concert had been abandoned by Johnson's last years as Music Director, but since the early 1990s, the January subscription program has become a Pops-oriented show. These concerts have been successful and fun for those on both sides on the OMT proscenium. Movie and TV composer Bill Conti lead a thoroughly enoyable program of his music during DeMain's first season, and January concerts in recent years have brought in several memorable artists. The better concerts of recent years have included performances by Jazz trumpeter Arturo Sandoval and his quintet, "Bravo Broadway," a trio of fine Broadway singers, Mercedes Ellington and her "Sophisticated Ellington" troupe, and earlier this season, a wonderful pair of performances by folksinger Arlo Guthrie. Johnson and the Madison Symphony Orchestra League had established a thriving youth outreach program in the 1960s and 1970s, with programs for fourth- and fifth-graders (the Fall Youth Concerts) and high school students (the Young People's Concert each Spring). These programs, which also feature young players selected as winners of the Youth Soloist, Steenbock, and Bolz Awards, have allowed thousands of area students to experience live orchestral music. Several additional concerts in the late 1990s were aimed a families with young children: Symphonasaurus™, Beethoven Lives Upstairs™, and other programs have provided an engaging introduction to classical music for the very youngest listeners. The institution of third annual youth concert last season is particularly encouraging. This program, called Symphony Soup, is designed for very young school-age audiences, from Kindergarten to second grade. This and the other youth programs are aimed at the very audience we most need to get into the concert hall to insure that the MSO will be around to celebrate its centennial. One of the most enduring dreams of the orchestra's conductors, musicians, and audience has been an adequate performance space. The cramped stage of the Central High School auditorium—later renovated and renamed the MATC Auditorium—was the venue for the orchestra's first concert in 1926, and was the orchestra's primary home through the late 1930s, and again from the late 1940s until 1980. The acoustics of this space were barely satisfactory, and it seated only 1,000 audience members. During his tenure, Prager also staged concerts in many venues across the city: the Parkview, Orpheum, and Capitol Theaters, and the University Stock Pavilion, and the orchestra eventually adopted the Masonic Temple Auditorium as its more or less permanent venue in the late 1930s. Heermann moved the orchestra back to Central High, and fought strenuously throughout the 1950s to make small improvements to this space. As early as the 1930s, Prager was calling for a new concert hall, and over the next 60 years, concert halls would appear and disappear on Madison's political agenda, like Leitmotifs in a Wagner opera. Heermann and other MCMA supporters were players in the long, strange, and ultimately doomed quest to build Frank Lloyd Wright's "dream civic center" in the 1950s. As originally planned, the complex on the shores of Lake Monona would have included a large concert auditorium, together with city offices, a jail, and a train station. When this project was resurrected in the lates1980s as the Monona Terrace, the MSO assisted in the opening celebrations, but the complex had been redesigned as a convention center. A concert hall was not at all part of the plan, though a rooftop stage for outdoor concerts had for a time been under consideration. Several more Civic Center plans, most including some type of large multipurpose hall, were floated during the 1950s, 1960s, and 1970s, but all failed. The grandest of these, the Monona Basin Project was, like the Monona Terrace, a repackaging of Frank Lloyd Wright's design. Had it been built as planned, it would have had the same essential shell as the present day Monona Terrace, but would have been largely given over to a 2300-seat concert hall. In the late1970s, as Madison was going through the downtown renewal that created the State Street mall, the city finally broke ground for the Madison Civic Center. The heart of the building was the 2000-seat Capitol Theater: an ornate hall that had been built for Vaudeville and silent movies in the 1920s. The new hall, renovated as the Oscar Mayer Theatre, was opened in 1980. The MSO had a new home, and the move to this new space was momentous: providing MCMA's groups with a much larger stage and room for a significantly larger audience. The positive effect of this new space on the orchestra was immeasurable, but it has always been apparent that the Oscar Mayer Theatre was built with movies in mind. Despite an increasingly large orchestra, moved ever further forward into the house, and despite increasingly sophisticated amplification, the acoustics of the hall are simply inadequate for orchestral music. In 1995, DeMain, Madden, MSO Board president Terry Haller and others explored the possibility of converting the Orpheum Theater to a dedicated concert hall. The Orpheum Theater was a virtual twin of the old Capitol Theater, and had been built at very nearly the same time. Acoustical shortcomings (again, the Orpheum is a movie house), and the daunting prospect of raising the money necessary to do an effective conversion made this project problematic, but the very real need for a new concert hall was increasingly apparent. In 1997 local businessman W. Jerome "Jerry" Frautschi—whose family had supported the MSO for much of its history—lead in the creation of the Overture Foundation, a group dedicated to exploring the creation of a new performing arts center in Madison. In July 1998 Frautschi stunned the community when he announced a $50,000,000 gift to the Overture Foundation. Eleven months later, he increased his gift to $100,000,000. (The gift would evenually total over $200,000,000.) Madison now had an unprecedented chance to create a concert hall from the ground up, and creating a home for the MSO was among the primary concerns of the Overture Foundation. The details of the Overture story will be familiar to anyone who has lived in Madison in recent years—like any good Madison issue, this has been a highly political battle. Issues of land use, historic preservation, philosophies of public art, and decisions about who would operate the new center have been debated, and in some corners are still being debated. In May of 2000, architect Cesar Pelli presented a design that attempts to balance as many of the community's interests as possible, while remaining faithful to the vision of a first-rate performance venue. Original plans had called for the Oscar Mayer Theatre to be demolished, or to be turned into a space for the Madison Children's Museum—the possibility of completely renovating the space had been abandoned early in the project—but many Madisonians called for the retention of the Oscar Mayer Theatre as a performance space. 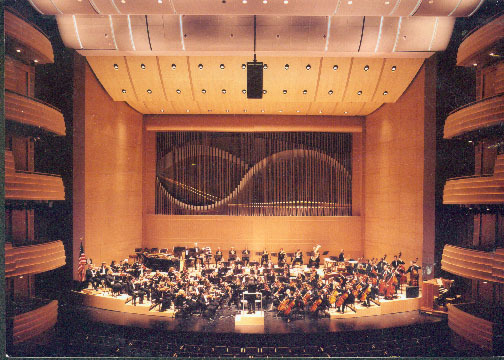 Pelli's plan calls for the creation of a new 2,200-seat hall by 2004, at which time the MSO will move from the OMT. The older hall will then be renovated into a smaller, 800-seat space that will accommodate the Wisconsin Chamber Orchestra and other smaller groups. These pages have been dedicated to the past 75 years of the Madison Symphony Orchestra. While no wise writer would presume to guess what the next 75 years will bring, it is fitting to close this history with a few words about the near future. These are happy days for the Madison Symphony Orchestra, and the 75th season has been a successful one. Community support for the MSO is at an all-time high, and a burgeoning endowment fund will help to secure a healthy future. Most encouraging for the MSO—both for the administration and for the musicians on stage—are large, nearly capacity audiences at both concerts of each subscription program this season (thank you!). The MSO's musical horizons have expanded enormously since the middle 1990s. Will the season itself expand? Some expansion is all but inevitable, it comes with tremendous financial, logistical, and artistic challenges. Not the least of these is availability of the musicians themselves. The orchestra's present contract of 70 or more services (rehearsals or performances) per season is already an enormous commitment for most musicians, and significant increases probably could not be sustained by many players. The increasing success of the Wisconsin Chamber Orchestra, which shares many players with the MSO futher complicates the picture. The next few years may prove to be one of the most consequential periods of change and development in the orchestra's history. Of course the most exciting element of the near future is the Overture project. As this chapter was being written, workers were taking the very first steps in constructing the new arts center. Maestro Johnson and many others have noted the effect of the orchestra's move to the Oscar Mayer Theatre in 1980: a larger stage, larger audience, and a sense of pride among the musicians made for a distinct increase in the quality of the orchestra's playing. When the new concert hall is completed in 2004, it will give the MSO a world-class performance space, and the results must certainly be another leap in the quality of its performances. The history of the Madison Symphony Orchestra—the oldest continuously-active symphony orchestra in Wisconsin—is perhaps typical of many similar musical organizations in mid-sized cities across America: the gradual growth of an amateur community ensemble into a professional one. If the same story has been played out elsewhere, however, the cast of characters in our version is unique. Sigfrid Prager—a German immigrant whose boundless energy and enthusiasm carried the orchestra through its first 22 seasons. His successor, Walter Heerman—who lead MCMA through the 1950s, and began the creation of a professional orchestra. Roland Johnson—whose remarkable 33-year tenure completely transformed the MSO. John DeMain—whose vision and skill brought the orchestra to the "next level." Vocational School director Alexander Graham—who gave the organization a home and a desperately-needed safety net in its early history. Community members, from Susan Seastone and the members of the earliest MCMA board through the many members of the MSO Board and Madison Symphony Orchestra League active in today's organization—volunteers who have devoted numberless hours of work to support the orchestra's concerts. Admistrative staffers like Robert Palmer, Sandra Madden, Richard Mackie, Lisa Fusaro, Ann Healey, and many others—who have made it their business to see that concert halls are full, that paychecks arrive on time, that endowments grow, that stages are set, and that the countless details necessary for 90 or more musicians to perform together are covered. And, most of all, there are the musicians of the MSO: hundreds of instrumentalists and singers who have performed in the orchestra and chorus since 1926. For much of the orchestra's history, this was purely a labor of love, with amateurs performing for the sheer excitement and satisfaction of creating fine music. This is, indeed, still the case with the Madison Symphony Chorus (which celebrates its 75th anniversary next season). However, even the most hardened professionals among the ranks of today's orchestra acknowledge that the MSO has a uniquely friendly and cooperative orchestral culture. Long tenures are the norm in this orchestra: the average length of service among the woodwind and brass players in this season's MSO is over 16 years, and there are many members of the orchestra who have played for a quarter century or more. Many retired MSO members retain a connection with orchestra as audience members and donors. Thankfully, many of the musicians from the orchestra's early years—40 or more seasons ago—are still living (a few, like Ann Stanke, Betty Bielefeld, and Marjorie Peters are still playing in the orchestra! ), and many have expressed their satisfaction with the state of today's MSO. However, Prager, Heermann, and nearly all of the founding members of the orchestra and chorus are no longer with us. We hope they would be proud.